The Los Angeles Times recently reported that immigration court case closures due to prosecutorial discretion appear to be on the rise. This means more cases are being temporarily closed due to the artful use of prosecutorial discretion. Although it has been in the news more frequently, prosecutorial discretion is not a novel, untested, revolutionary idea. Prosecutorial discretion is used frequently in the criminal justice system. After an arrest is made by the police, it is the sole decision of the District Attorney’s office (or in some places, the “State Attorney” or “Commonwealth Attorney”) as to whether enough evidence exists to file a criminal complaint or information. In lieu of going through the rigamarole of a full trial, prosecutors may offer a defendant the opportunity to accept a “plea bargain” — for instance, less severe charges, less jail time, community service, or rehabilitation programs. If every single case went to trial, the judges would be overwhelmed. The same concept works in immigration: prosecutorial discretion seeks to lessen the strain on an already-overwhelmed system. (In 2013, the immigration court “backlog” had risen 85% in the last five years.) Immigration and Customs Enforcement (ICE) does not offer to “dismiss” the deportation/removal case, but rather to place the case on “administrative closure.” This allows the court to take the case off the active docket. A case on administrative closure can be re-activated (or “re-calendared”) by either ICE or the immigrant at any time. Similar to the criminal justice system, ICE has the discretion to decide not to issue a Notice to Appear in the first place. Prosecutorial discretion allows ICE to focus its limited resources on going after “high priority” cases — for example, persons with serious criminal convictions, or persons with existing removal orders. 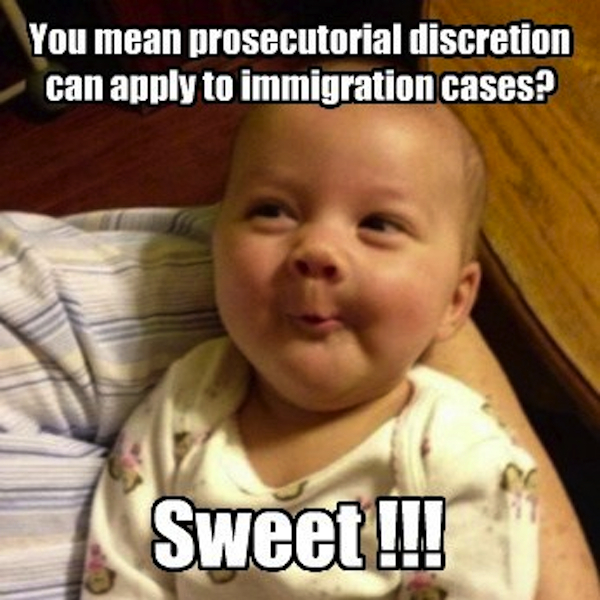 To determine whether to offer prosecutorial discretion, ICE considers criteria such as length of residence in the United States, family ties, age, and criminal history (or the lack of a serious criminal history). Although every case is different and must be analyzed according to its unique circumstances, if you feel that you may be a good candidate for prosecutorial discretion, please feel free to contact me. Also, I would like to acknowledge the insights of my colleague Ivy Blum. If you find yourself in need of someone who knows her way around the criminal justice system, feel free to contact Ivy.